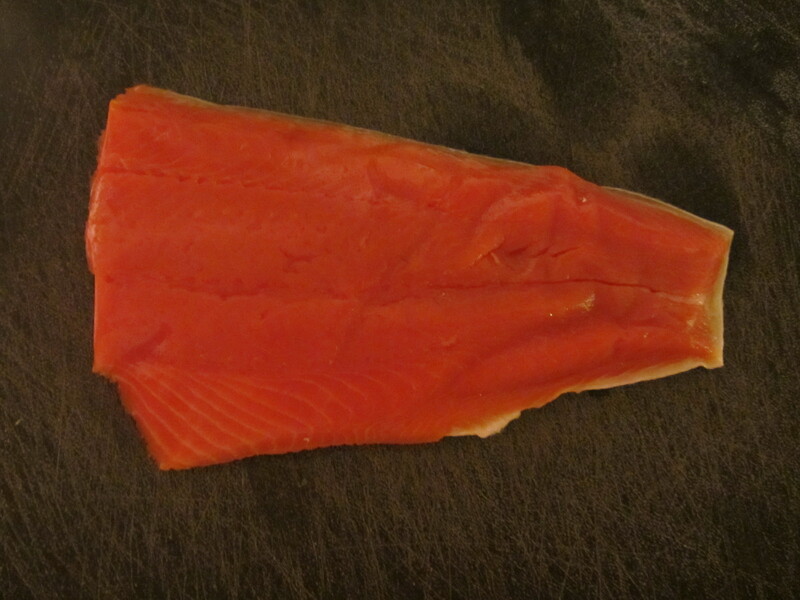 I live in the Northwest, where we tend to eat a lot of fish, so I was excited for the 10th episode of Good Eats. I printed out the two recipes posted online and sat down to watch the episode. To my surprise, there was an additional (third) recipe featured in the show. 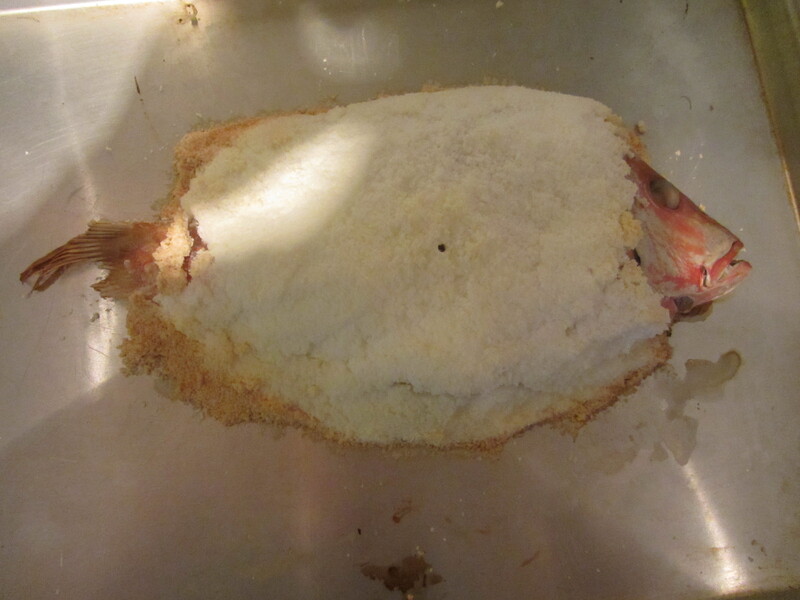 Why this recipe is not posted online I don’t know, but it is for a whole fish cooked in a salt dome. I had never cooked a whole fish before, so I was excited and nervous about this preparation. Alton uses a six pound Striped Bass when he makes this on the show, and I knew we were going to need a considerably smaller fish. Still, when I made this last week, we had my parents over to share in our two pound Red Snapper. 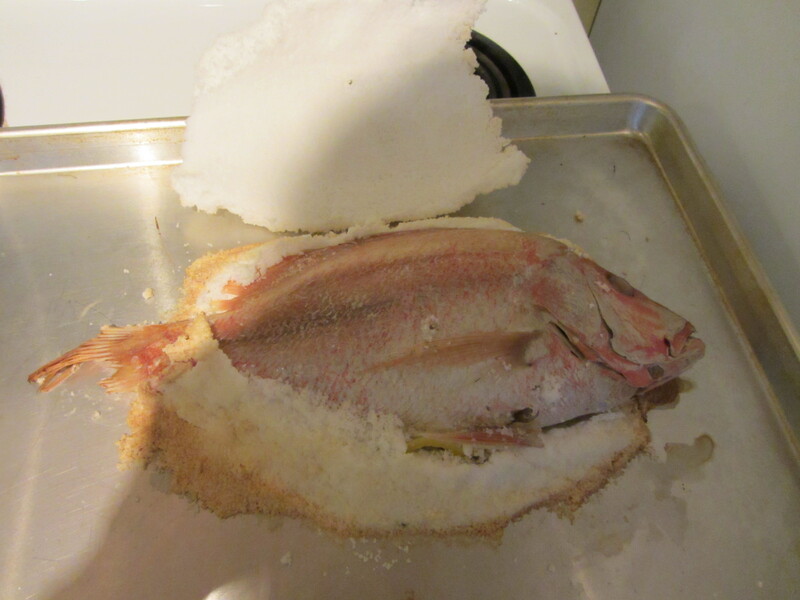 I will confess that we had a frozen pizza on hand, just in case I botched the fish! 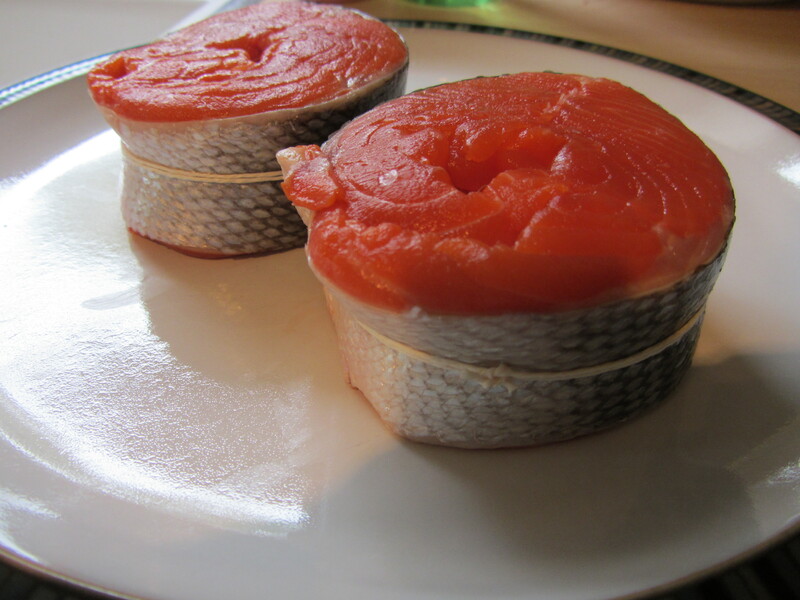 Alton tells you to use a pound of Kosher salt per pound of fish. A pound of salt per pound of fish. This is combined with egg whites and some water, and mixed by hand. 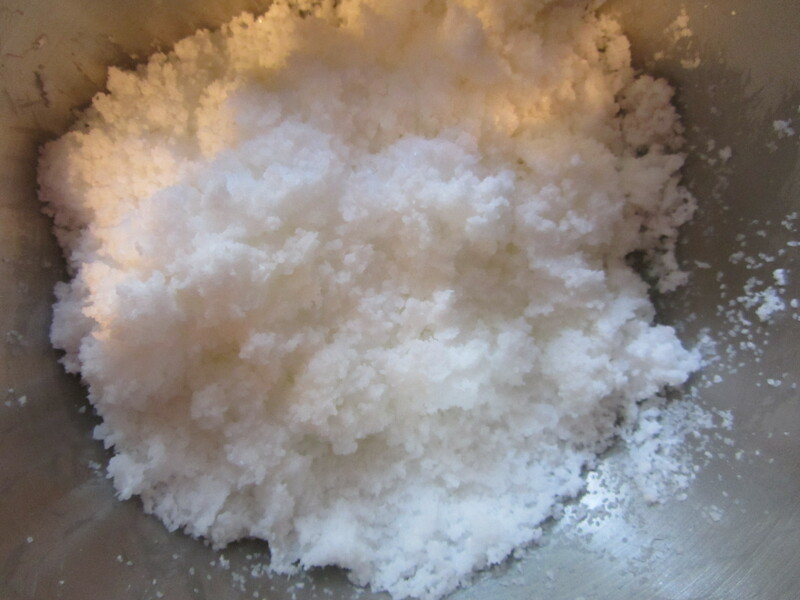 For our two-pounder, I used two pounds of salt, two egg whites, and a bit less than 1/4 C of water. 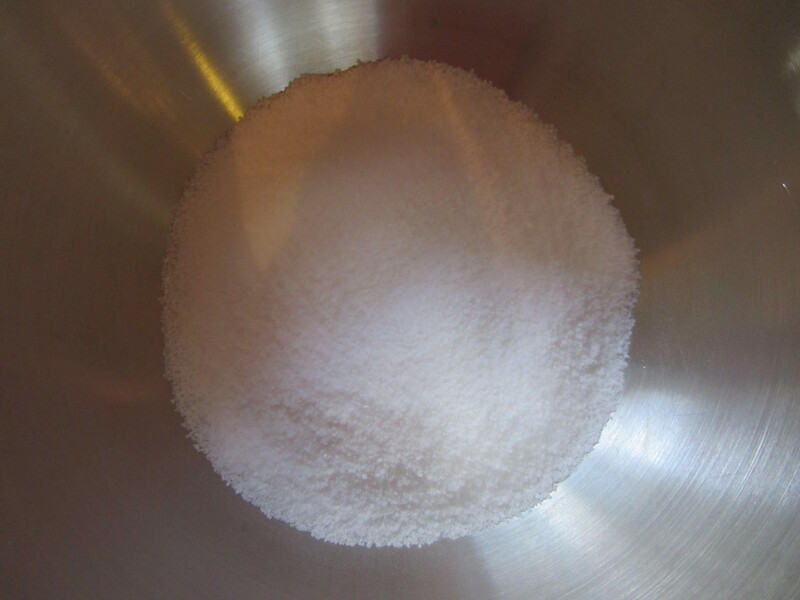 Salt with egg whites and water. Mixed to a mortar-like consistency. 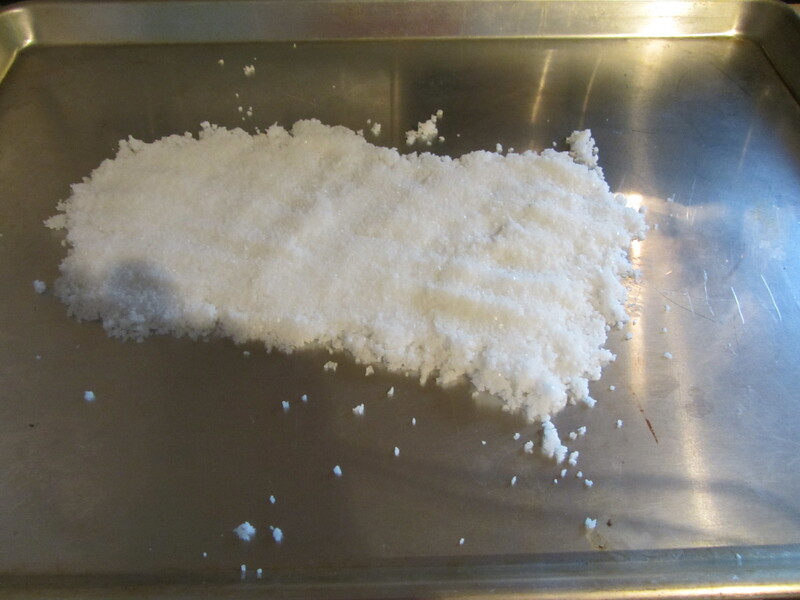 You spread a 1/2″-thick layer of this salt mixture on your baking sheet as a bed for your fish. Bed of salt for the fish to bake on. 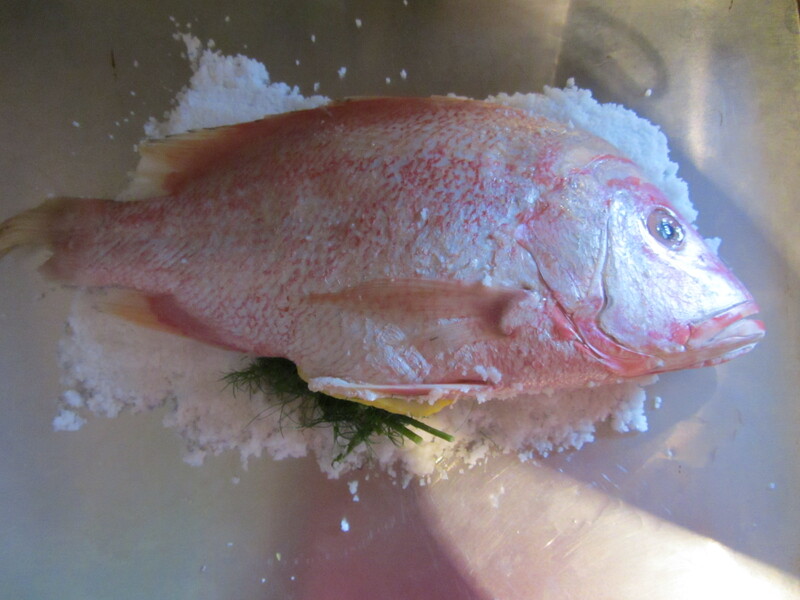 Your fish is placed on top of the salt layer, and you fill his cavity with whatever aromatics you have on hand. For my fish, I used fennel, dill, lemon slices, and orange slices. 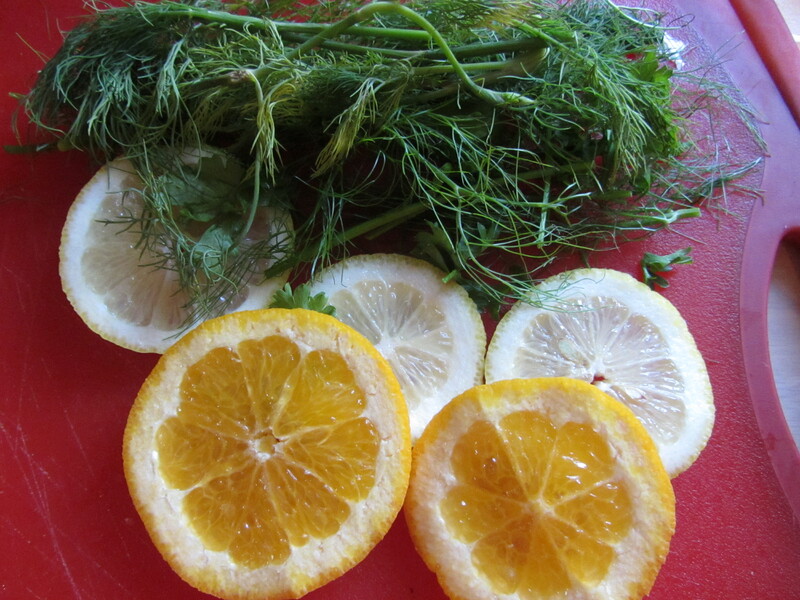 Dill, fennel, orange, and lemon. Red Snapper stuffed with aromatics. 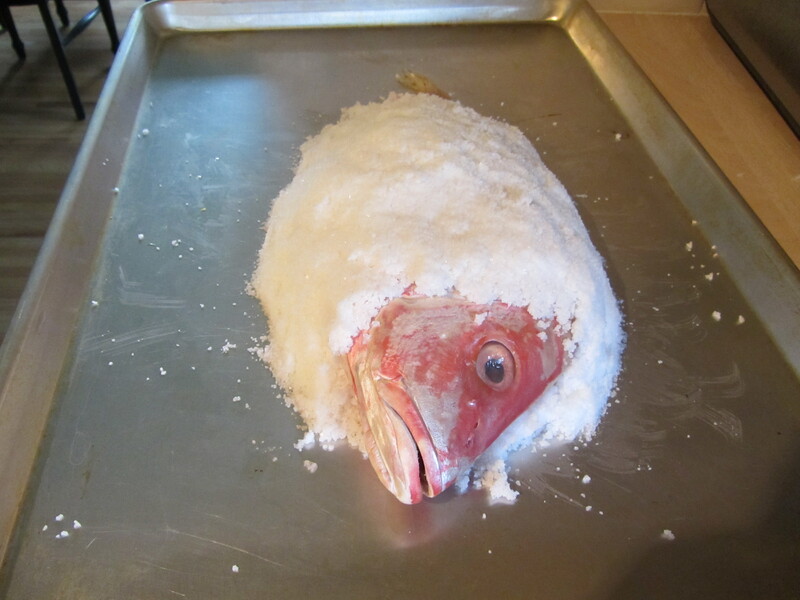 The remaining salt mixture is mounded over the fish’s body, forming a dome with only the head and tail visible. I had a little more salt than I needed, but I still had a healthy layer of salt all over my fish. Fish in his salt dome, and ready for the oven. I baked my fish at 450 degrees, checking it after 20 minutes, and it happened to be done. You want to cook your fish to a temperature of about 130-135 degrees (you can take the temperature of the fish straight through the salt dome). I let my fish rest for about 5 minutes before beginning to remove my salt dome. In the episode, Alton suggests using a mallet or hammer to crack your dome, but I simply used the serrated edge of my pie server (the tool Alton recommends to use for serving the fish) to form a crack along the front of the dome. I was nervous that my dome would shatter into a million messy pieces, but the lid lifted off in one beautiful piece, revealing a perfectly cooked Red Snapper inside. At this point, you remove the skin from your fish and cut the meat from the top half of the fish. 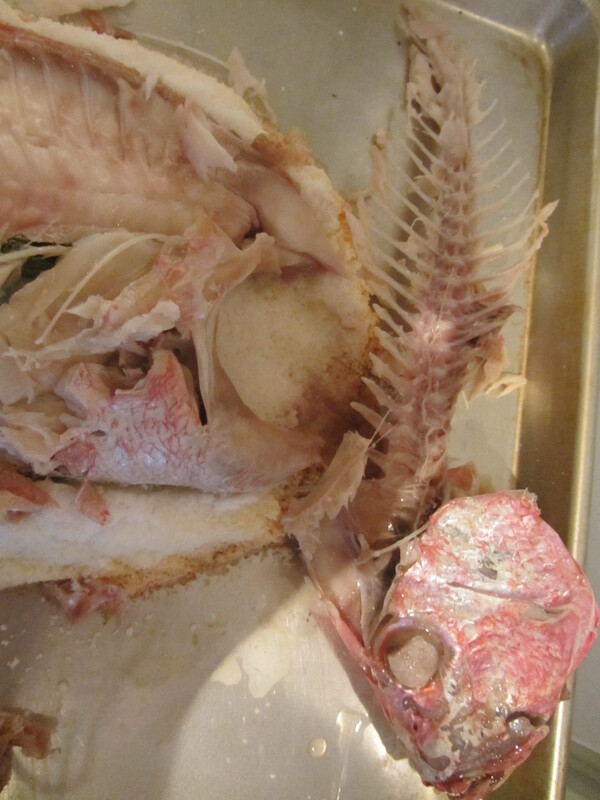 You grab the fish’s tail, give it a twist, and the bones should lift out in one big piece. This actually worked seamlessly for me, and, as a bonus, the head popped right off with the bones, which meant I no longer had that creepy eye looking at me. Once the bones are removed, you have access to the bottom half of the fish, which you can lift right off the skin for easy serving. Bones came out in one easy twist. 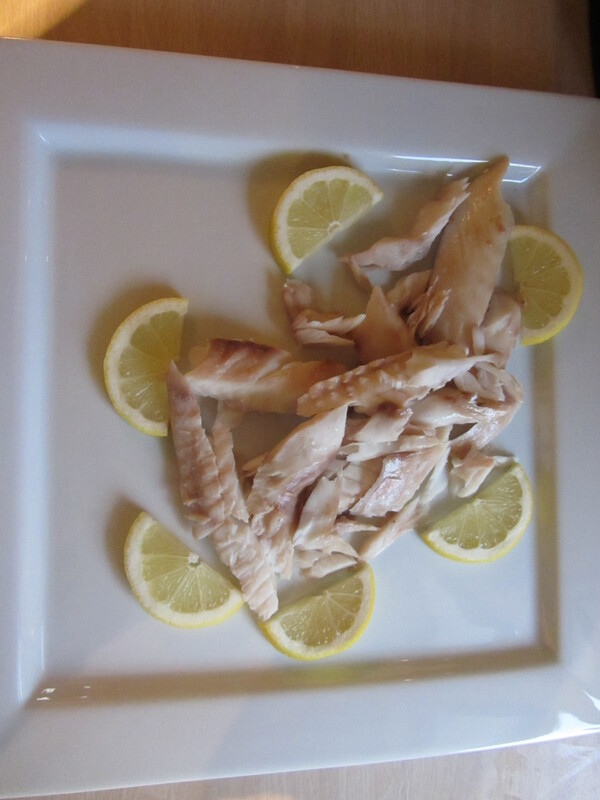 Completed fish, served with lemon. Ted, my parents, and I all thought this fish was a big success. The fish itself was moist, and the flavors of the various aromatics really came through. I particularly tasted the dill and fennel. Ted and my mom commented that they thought the fish had a hint of saltiness, but it was far from salty. Lemon wedges were the only adornment needed. I served the fish alongside couscous with currents and almonds, and a minted pea salad. This recipe intimidated me a bit at first, but it was super easy and delicious, and the presentation is fun. This is one I will be making again. The second recipe in the 10th episode is for Pan Fried Fish. 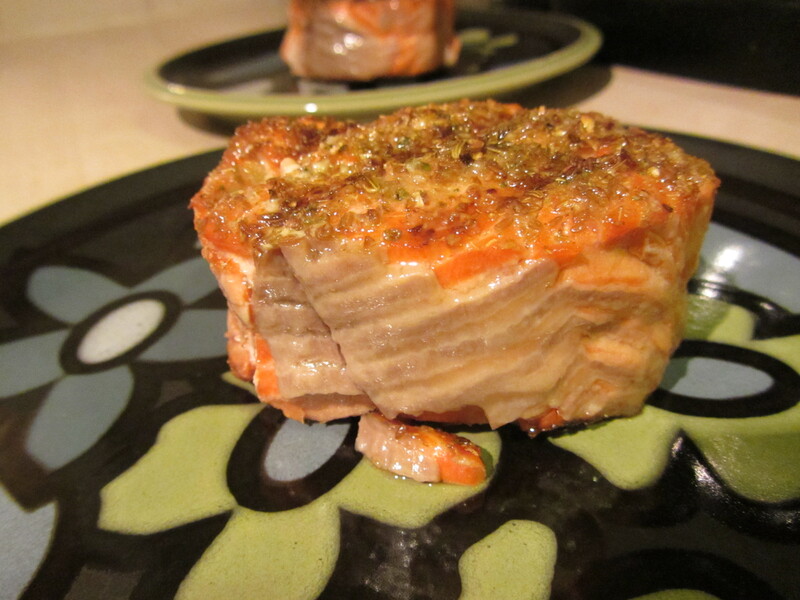 For this recipe, you use a fillet of fish, and we happened to have some frozen Copper River Salmon fillets on-hand. 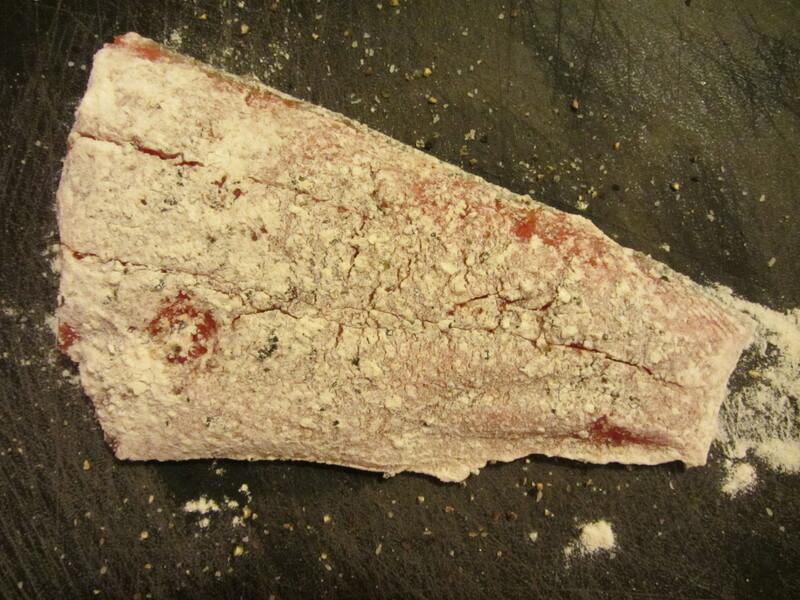 You season your fillet with salt and pepper and dredge it in flour. 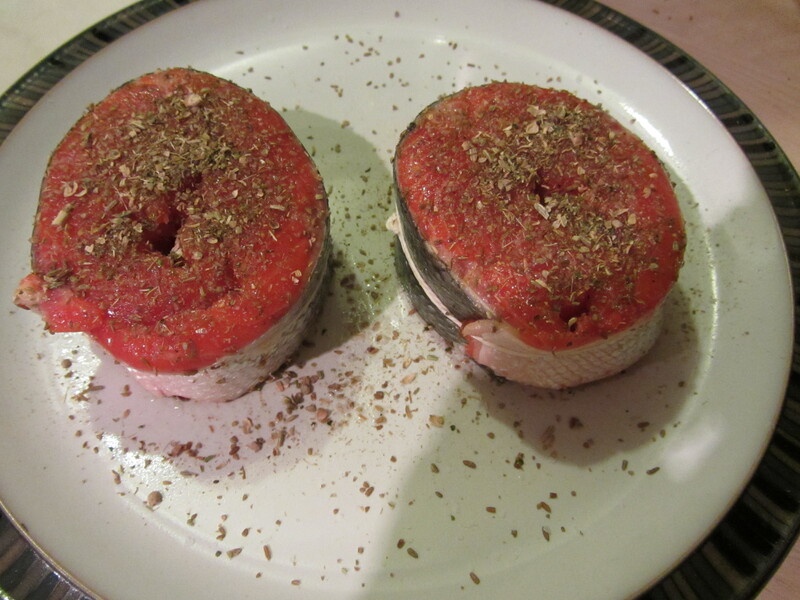 Fillet seasoned with salt and pepper. 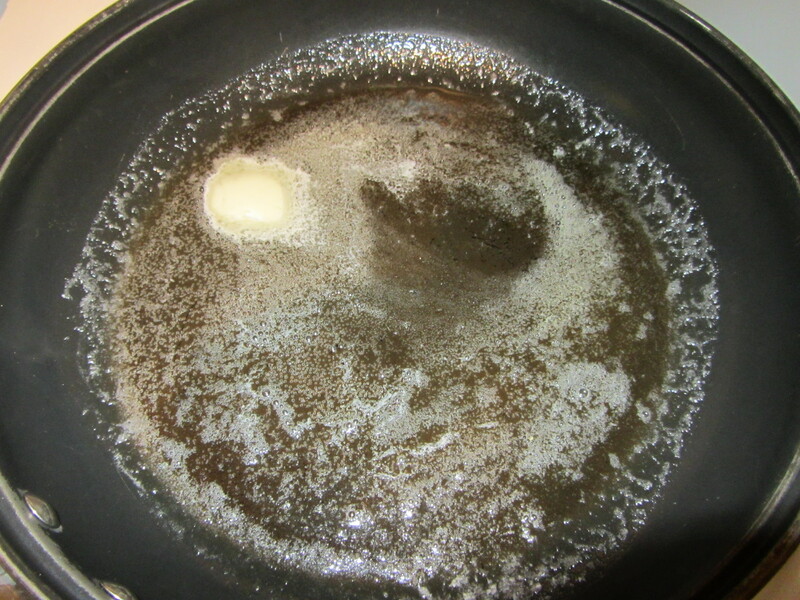 Meanwhile, you heat Canola oil in a skillet, along with some butter. 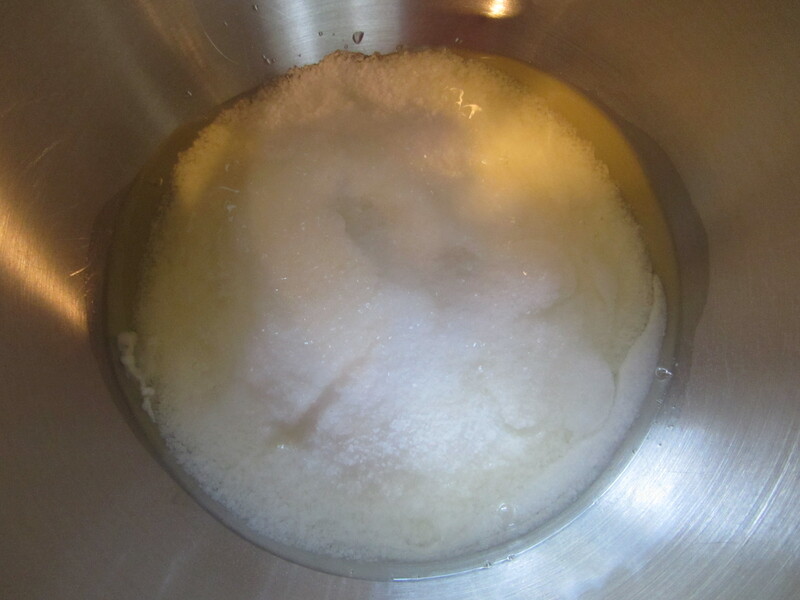 Once the butter has ceased foaming, you put your fillet into the pan. Butter and oil in the pan. Alton emphasizes that you want to jiggle the pan for a few seconds to keep the fish from sticking. 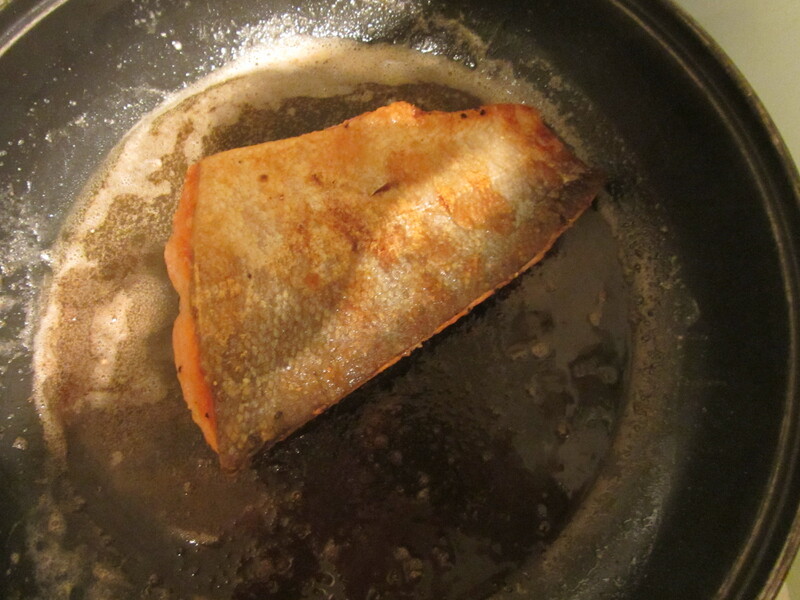 Once the fish is golden, you flip it to the other side, again jiggling the pan. 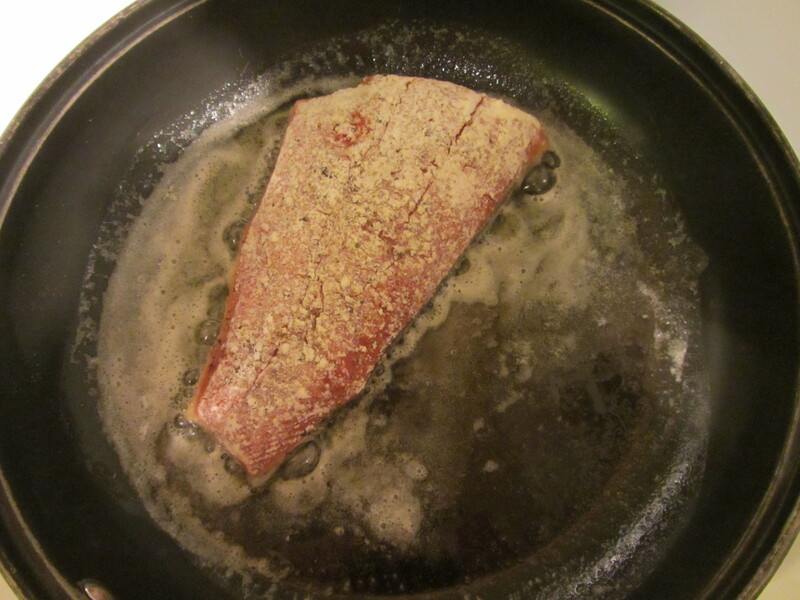 You want to cook the fish just until the muscles start to separate, and then remove it from the pan. 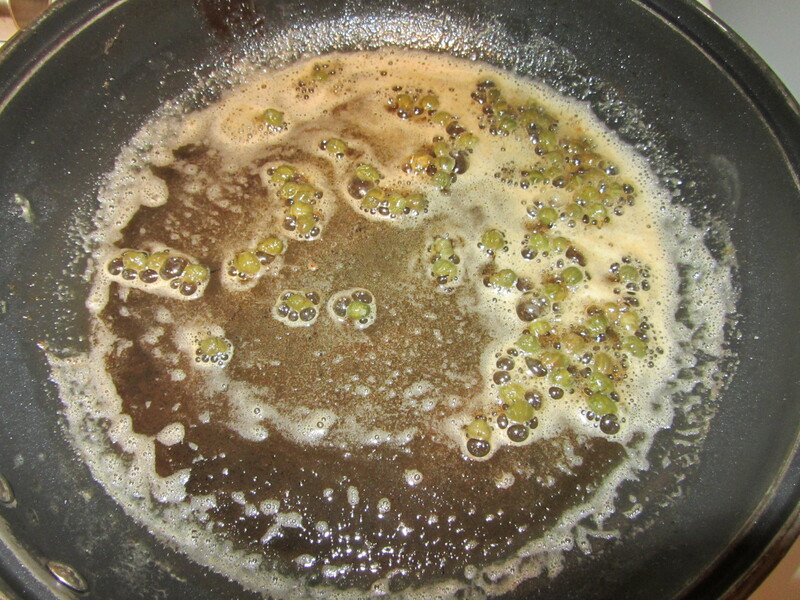 You pour out the fat, add additional butter to the pan, and fry some capers, which will visibly plump. 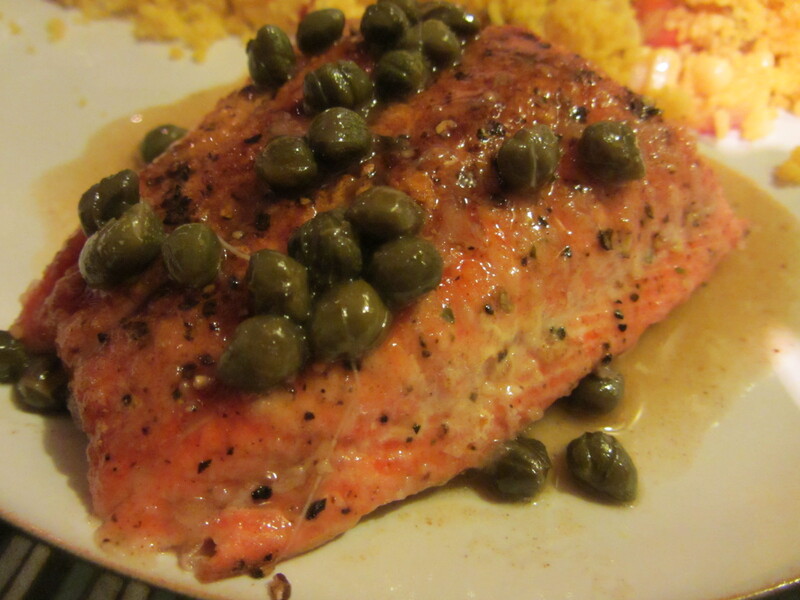 You remove the pan from the heat, add the juice of a lemon, and pour the caper sauce over the fillet. Super easy, super fast, and super good! The fish paired with the briny capers and the tangy lemon makes an excellent combination. 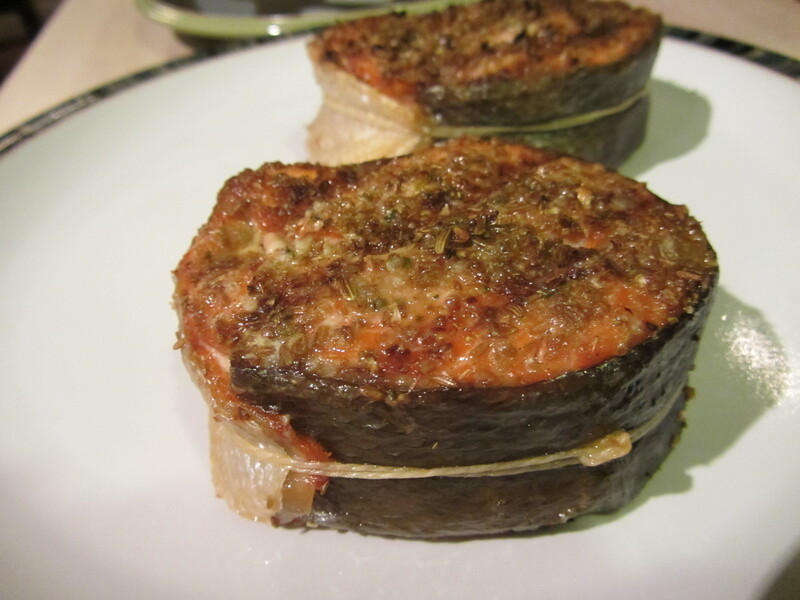 We tend to grill fish most of the time, but this is a great alternative. The final recipe from the 10th episode is for Grilled Salmon Steaks. I typically tend to prefer fillets to steaks simply because you do not have to deal with the bones when you have a nice boneless fillet. I recall a time when I was a freshman in college and I went to a party at a friend’s house. It was a BYOM (that’s Bring Your Own Meat) party. The grill would be fired up, but it was up to you to cook your meat at the party. 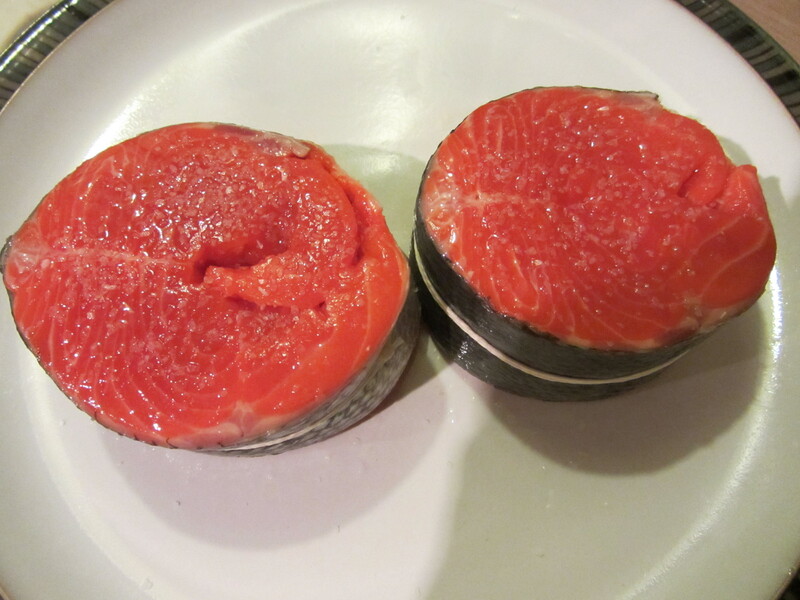 I was not a huge red meat eater at this time, so I opted for salmon at the grocery store. 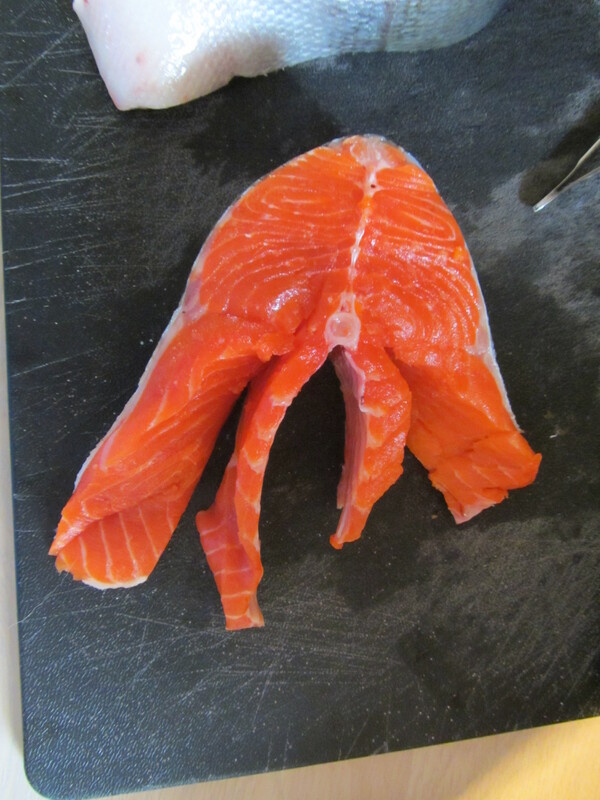 I made the mistake of getting a salmon steak, rather than a fillet. 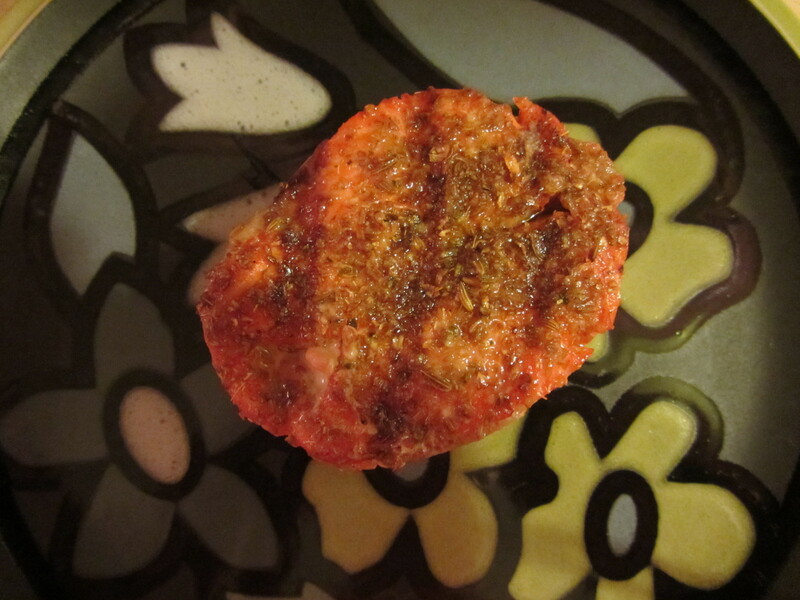 Not knowing that I needed to prep the steak prior to grilling, I simply threw it on the grill as it was. I remember being very disappointed with the plethora of bones I encountered, and I made every effort to get fillets from there on out. 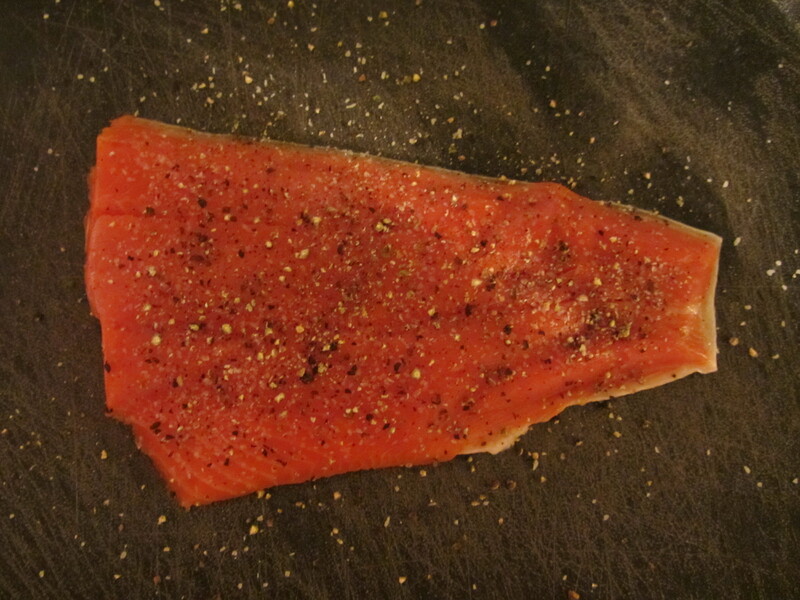 Honestly, that may have been the last time I cooked a salmon steak prior to this recipe of Alton’s. 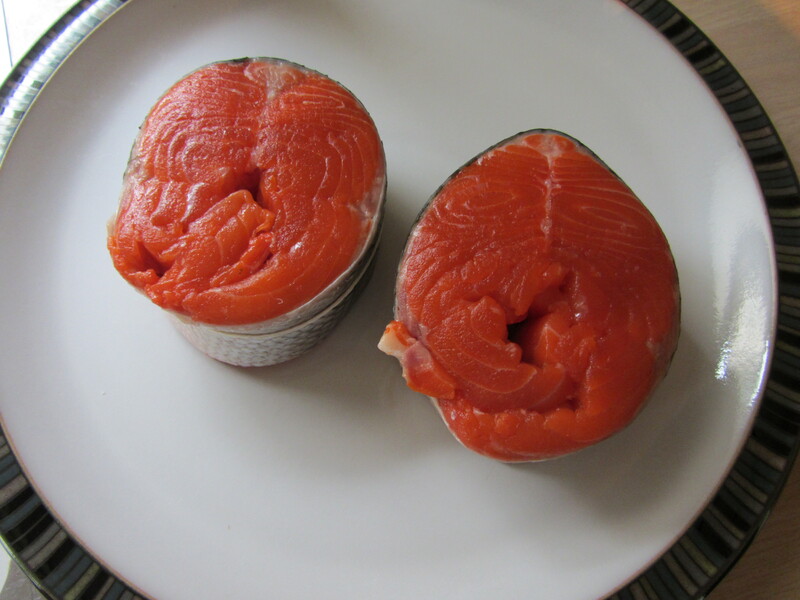 It was key to watch Alton’s preparation of the salmon steaks, as it was hard to visualize the technique from simply reading the online recipe. To begin, you run your fingers over the surface of the steaks, removing any pin bones with tweezers. Now, some of these bones came out very easily for me, while others were real buggers. The next step is to trim the cavity sides of the steaks. 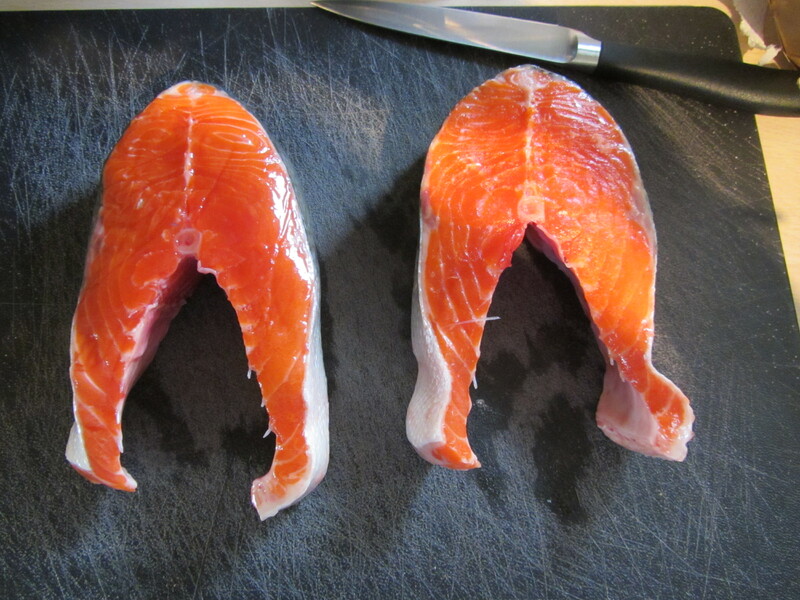 You do this with a sharp knife, and then use scissors to cut out the bony center. At this point, Alton smoothly and seamlessly glides his blade down the stomach flaps, leaving one side without some skin and the other without some meat. This will allow the excess skin on the one flap to perfectly overlap the skinless meat on the other flap. This step was not quite so effortless for me, and I’m sure I hacked away more of the fish than I needed to, but I made it work. Trimming the cavity side, and shortening the flaps. After this trimming, you roll the two flaps up into the center of the steak, overlapping the longer flap over the shorter flap, and you secure the round with butcher’s twine. I was actually quite surprised that my steaks looked as good as they did after this step. Mine had a bigger “hole” in the center than Alton’s did, but they otherwise looked pretty good. Rolled up and secured with twine. Once your steaks are tied, you make a seasoning blend of cumin seed, coriander seed, fennel seed, and green peppercorns. This blend is toasted over the grill, just until fragrant. 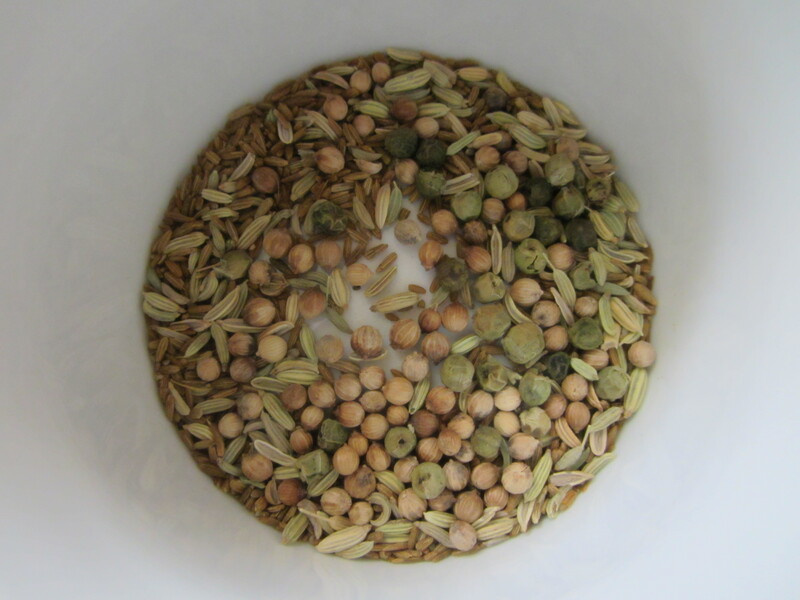 Cumin, fennel, coriander, and green peppercorns. Prior to grilling the steaks, you coat them with oil (along with the grill), sprinkle them with some Kosher salt, and then liberally sprinkle them with a ground blend of the toasted seasoning mix. We had an extra pepper grinder in our kitchen, so I used that to grind the spices. Alton tells you to grill the steaks for approximately three minutes per side, but I found that my steaks took a few minutes longer than that. Once done grilling, you simply cut the twine with scissors, and the skin comes right off with the twine. The skin came off easily with the twine. Ted and I were both surprised at how good we thought these steaks were. 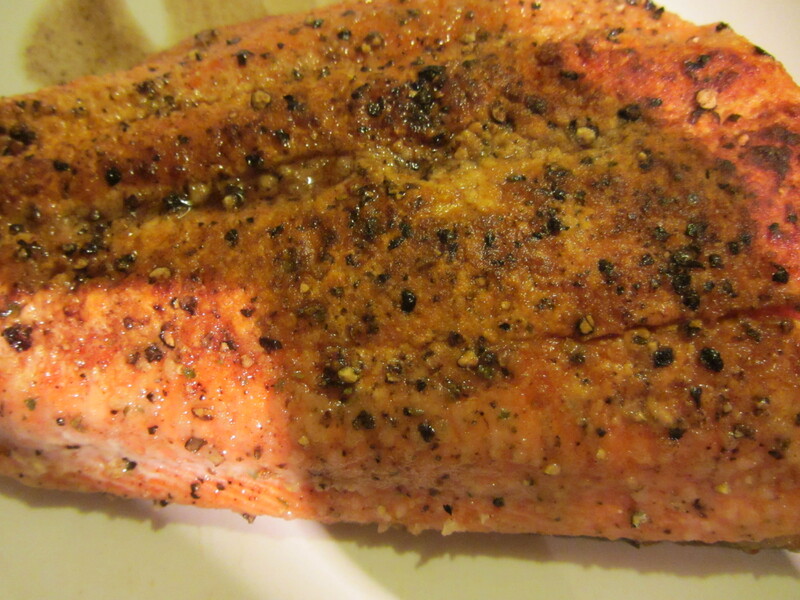 The fish was moist and the spice blend paired excellently with the salmon. There were almost no bones in either of our steaks. Though the recipe first appeared to be labor-intensive, it really was pretty easy to execute, and with further practice it could be a quick go-to for grilled salmon.